Pak Wahn Vegetables: Pak Wahn Greens Cooked in Fresh Coconut Milk with Shrimp (Pak Wahn Dtom Gkati). 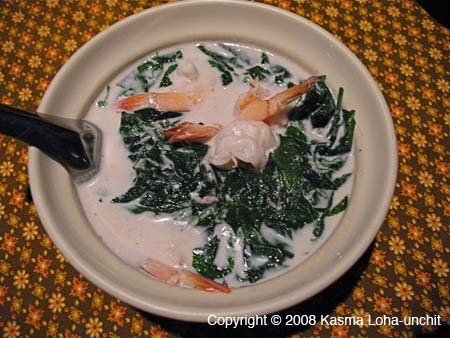 Kasma's equivalent recipe is Leafy Greens Cooked in Coconut Milk with Shrimp (Pak Dtom Gkati) taught in Advanced Series Set D (class 1). It's a fabulous dish made with any of the leaf greens such as kale or chard.